Finally, the LED product you have ALL been waiting for! This Rare, compact and yet "see-through" led control box will allow you to control all your car lighting accessories from one easy-to-reach location, while at the same time acting as an attractive LED lighting accessory for the interior of your vehicle. Rated at a TOTAL of 5 amps, this eye-catching led control panel will control many different lighting accessories with a flick of a switch, such as; neon undercar kits, LED under car kits, interior tubes, strobe lights and more. 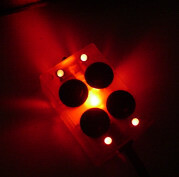 The LED Distribution Control Panel features a "transparent box" which has a colored LED on the inside of the box, and once activated, it makes the whole box glow to the color of the LED inside, creating an awsome lighting effect in your car. All neon and LED lighting kits on the market today for automotive applications will work fine with the LED car Control Panel. Please Click Here to see other pictures of the control panel in its many colors and angles. 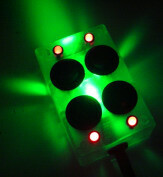 Your choice of GLOWING color for the Control Panel. The panel comes in 2 types. 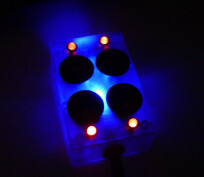 One being a BLUE TRANSPARENT BOX with a blue interior LED, which glows blue when lit, or a CLEAR TRANSPARENT BOX with either a blue, green, yellow, red, pink, or even a multi-color interior LED. The CLEAR box will glow to it's respective color. 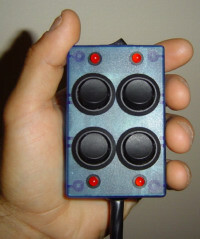 4 channel switch panel. The four channels allow you to hook up many different light kits to the panel, which effectively gives you the ability of controlling them individually. If you want 3,5,8 or more light kits installed onto the panel then this can easily be done by linking 2 or more light kits into the ONE channel. However, should you install lighting accessories to the panel that draw more then the TOTAL current rating of 5 amps, then your going to need to know how to install a relay onto the control panel to Maximise it's use. 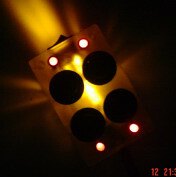 4 red LED indicator lights that tell you which lights are on, and which one's are off. A main ON-OFF switch to turn off ALL the lights at once, should the police be on the prowl! Compact design with ONE neat and tidy power cord going into the panel, with which you will use to hook all your lights into. This 60cm long cord can also be used to mount the LED Distribution Control Panel, see pictures here for examples. Box Measures 5cm wide, 8cm long by 3cm deep. All necessary instructions and hardware are included to ensure a smooth installation and are backed-up by the All-Neon-Car-Lights.com Warranty. We are now taking Orders for the LED Distribution Control Panel, so be sure to get your order in right away to reserve yours today - Stocks are Limited. $89.00USD Each. Mutli-color & Pink $99.00USD On Special This week Only Hurry!